A blood bank is a place where recipient blood is typed (grouped) and screened for antibodies, and crossmatched for compatibility prior to transfusion with donated blood.The term 'blood bank' can also refer to a place where donor blood is collected, separated and stored. This guide is intended for immunohematologists working in the transfusion/compatibility testing department. Blood banks face the same challenges as other clinical laboratories and this has shaped the direction of blood bank automation. The challenges vary depending on geography, but many laboratories have to deal with increased workloads, reduced staff levels, increasing costs of manual reagents, more rigorous patient safety initiatives, and tighter regulations. In the transfusion laboratory, where manual methods have traditionally dominated, automation is helping to improve the safety of transfusion, increase efficiency and standardize work practices. Blood bank automation was introduced in the 1960s, and many transfusion departments have already moved to automated analysis; however, a large number of smaller laboratories and field sites still use manual methods. Tube testing has traditionally been the gold standard for ABO and Rh grouping, antibody identification and crossmatching, although this is increasingly less true of modern blood banks. The method is relatively simple and inexpensive, although the cost of manual reagents is rising. The disadvantages of manual analysis include labor-intensive work, reduced efficiency, repetitive processes and a much lower safety record due to user error. Even small laboratories can benefit from automation, which frees up technical staff for other tasks that better utilize their skills. Automatic crossmatching also offers reduced risk of incompatibility due to user error and/or incorrect labeling or specimen processing. 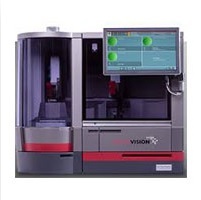 One of the main disadvantages of automation is the large start-up cost – automated immunohematology is expensive and can require a significant initial outlay. It may be possible to draw up a reagent rental agreement with your chosen supplier, where the manufacturer supplies the instrument and maintenance for free, based on a projected workload, and the user agrees to a reagent contract. Automation of traditional tube agglutination methodology is difficult because of numerous factors, not least the lack of a stable endpoint – once the tube reaction has been resuspended, it cannot be viewed again. Manufacturers are now using three main types of technology: column agglutination technique (CAT), solid phase red cell adherence assay (SPRCA), and erythrocyte-magnetized technique (EMT). Manufacturers using CAT technology include Bio-Rad (ID-System, IH-1000), Ortho-Clinical Diagnostics (BioVue) and Grifols (Erytra). CAT involves the use of plastic cards with 6-8 inbuilt microtubes, with a broad reaction chamber at the top and a clear gel/glass bead matrix at the bottom. Agglutinates are trapped within the gel matrix, and unsensitized cells form a button at the bottom of the microtube. There are two types of gel card: phenotyping for ABO and Rh – pre-filled with anti-sera, to which patient red-cell suspension is added; and AHG cards for IAT and DAT – pre-filled with anti-human globulin (AHG), to which patient plasma is added. Manual use of gel cards requires the technician to pipette, incubate, spin and read the cards. But CAT technology allows for both partial and complete automation. Both Bio-Rad and Ortho-Clinical Diagnostics manufacture gel-stations that can automate pipetting, incubation, centrifugation, reading and interpretation. Full automation of CAT technology allows for a complete walk-away system and usually includes barcoding, bi-directional interfacing and STAT functionality, as well as continuous reagent and sample loading. CAT can be used for grouping, cross-matching and antibody screening. In SPRCA, the antigen/antibody is immobilized on to a solid medium, coating the base of a U-shaped microplate well. This is then allowed to react with free antigen/antibody. Microplates are coated with anti-sera for forward grouping, and RBCs for reverse grouping. The end point of the reaction is determined by the addition of red cells, which may be part of the antigen-antibody reaction, or may be added externally as indicator cells. SPRCA can also be adapted for crossmatching and platelet serology. Manufacturers that use SPRCA technology include Immucor and Bio-Rad (Tango Optimo). EMT involves the use of paramagnetic particles, which are fixed to the RBC surface either by adsorption or GPA glycoprotein binding. When a magnetic force is applied to the base of the plate, the RBCs migrate towards the magnet. The technique has the advantage that it completely eliminates the need for centrifugation. In forward grouping, iron chloride, bromelin and the RBC suspension are dispensed into the microplate well which has been pre-coated with anti-sera. After a short incubation period, the magnet draws the RBCs to the bottom of the plate. In reverse grouping, pre-magnetized RBCs are mixed with antisera in the well, and following incubation, the cells are also drawn to the plate base using a magnet. EMT can also be used for crossmatching and antibody screening. The needs of the blood bank will vary between each department, depending on how busy the laboratory is and the type of testing it carries out (donor screening, group and screening, crossmatching, antibody identification). You should also plan in advance whether you need to change the type of specimen tubes you will use, what type of barcodes you require, sample workflow as it enters the department and data inputting. In your planning, you will need to determine whether you have the physical space required for your chosen system, reagent and consumable storage, waste disposal and sample storage. New standard operating procedures will need to produced, and staff training on the new equipment is essential. Your chosen vendor may supply this training, or you may need to draw up a training schedule and competence assessment for users. It is vital to factor into any decision the additional costs involved in upgrading a laboratory system. Hardware and software requirements, reagent costs, cost for altering physical spaces, and storage costs (purchase of refrigerators, storage units etc) will all need to be considered. Management of samples during downtime, scheduled or otherwise, must be considered. Your vendor may supply a back-up manual method, or a semi-automated back-up analyzer. Routine maintenance time should be factored into your SOP. How you will monitor QC should be planned, QC schemes assessed and competency assessments for users planned. Back-up systems will also need to be included in the daily QC schedule. Any system must be compatible with your existing LIS. It may be necessary to include your LIS provider in any negotiations with your chosen vendor. Installations are often delayed due to interfacing issues, and this should be taken into account when determining timescales. Getting feedback from other users (and not the manufacturers) is vitally important when making your purchasing decision. You can view system reviews on SelectScience, and if possible you should arrange to visit other laboratories that use your chosen analyzer so that you can get honest feedback and learn from the experience of others. Your testing requirements will determine the analyzers that you are looking to purchase. 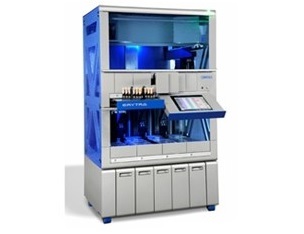 Bio-Rad Tango, Grifols Erytra, Immucor Echo/ Neo, Ortho ProVue/AutoVue, QWALYS Diagast are all automated options for laboratories wishing to carry out group and screens, antibody identification and crossmatching on a single analyzer. If partial automation is the goal, Ortho-Clinical Diagnostics, Grifols and Bio-Rad manufacture card readers, which offer manual labs the opportunity to take advantage of enhanced productivity and consistent results. The latest blood transfusion technologies have emerged in response to the need for improved safety, traceability, desire for standardization, and increasing workloads. The emergence of new technology has been enabled by advances in software and interfacing, so that many laboratories are now able to take advantage of these options. Hemagglutination has limitations including the subjectivity of results, difficulty in phenotyping certain patients (e.g. those recently transfused, those with a positive DCT), and small antigen-negative donor red cell stock due to time intensity of hemagglutination methods. It can be very difficult to find compatible donor blood for patients requiring repeated transfusions due to infections, or chronic disorders such as sickle cell anemia or thalassemia. Molecular diagnostics could overcome the limitations of hemagglutination, and the use of DNA-based tests to predict phenotype is increasing. Until now, molecular characterization has been laborious, time consuming and not suited to the transfusion laboratory. 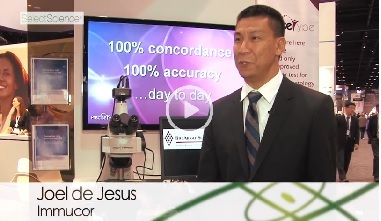 Modern DNA microarrays have the potential to allow for a high enough throughput to make molecular testing viable. To date this technology is not fast enough to be considered suitable for routine blood bank testing and there are no such systems approved for diagnostic use. The type of analyzer that you purchase depends on the testing requirements of your department, geographical availability of instruments, and budget. Modern automated systems for the blood bank increase throughput and efficiency while lowering safety risk to transfusion recipients and reducing potential for human error. Molecular diagnostics may help to further improve the safety of the transfusion department when used in conjunction with routine automated methodologies. As well as carrying out a thorough evaluation of products on the market, it is extremely valuable to learn from the experience of others. Many blood bank managers have already been through the process of automating their department, and they are now in a position to use their experience to benefit others. 1. Gassner C, Meyer S, Frey BM and Vollmert C. Matrix-Assisted Laser Desorption/Ionisation, Time-of-Flight Mass Spectrometry–Based Blood Group Genotyping—The Alternative Approach. Transfusion Medicine 2013;27 2-9. This guide is not inclusive of all blood transfusion analyzers available on the market. Not all analyzers are available in all countries. "The stat function is very useful at night to get the analyzer started quickly. The bi-directional interfacing is excellent." "Overall, I really like using the Galileo ECHO analyzer, we use the analyzer to do routine blood group good typing, although our current policy took out the use of week D testing."